Affordable solution. While being less expensive than other types, aluminum gutters are custom-fabricated to fit your house. Different sizes, styles, and colors are available. Almost every house needs gutters and downspouts. If your home does not have effective roof drainage, roof runoff will settle right next to the foundation. This substantial water will damage plants, decks, patios, and exterior siding while also eroding the soil around your foundation. Inside the house, the basement can flood. While providing effective drainage, gutters also need to look good because of their prominent position on the exterior of the building. Many homeowners choose to replace their gutters and downspouts during a roof replacement. The term “seamless” explains the major advantage of this type of gutter. This gutter system can be custom-made to any length required, eliminating the need for seams. The magic of making seamless gutters occurs inside a gutter machine. The flat aluminum sheet that enters one end of the machine comes out the opposite end formed into the finished gutter profile. The most popular profile for seamless gutters is a “K” style gutter with a curved front edge. Contact us today for a free estimate of seamless aluminum gutter installation throughout the Greater Saint Louis area! 1. From flat to formed. This K-profile gutter starts out as a flat sheet of aluminum. The gutter machine forms the profile, enabling the crew to create seamless gutters at any length. After the machine trims the gutter to the required length, workers attach end caps, then crimp and seal the caps to make the gutter watertight. 2. Brackets add strength. These cross braces are installed every 36 in. or so to stiffen the gutter and add stability. The brackets also provide attachment points for screwing the gutter to the fascia board during gutter installation. Durable, factory-applied finish. Aluminum gutters come with a factory-applied finish that is available in a wide variety of colors to match your home and/or roof. The finish does not fade so it won’t wear off or require maintenance unless you have to touch up scratched areas. No rust or corrosion. Aluminum won’t rust or corrode; it is truly a no-maintenance material. Speedy installation. A skilled crew can usually complete a seamless gutter installation on an average-size house in a single day, as long as the fascia boards along the eaves are also in good condition. Want to have your home inspected to find out if aluminum gutters are right for your home? Call Bone Dry Roofing at 1-844-778-2185 or contact us online for a gutter installation estimate. 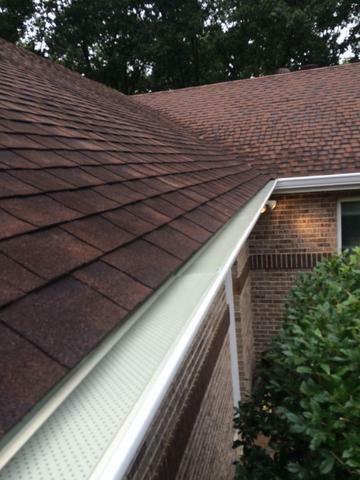 We will also inspect your gutters as part of our roof inspection. We provide quality roofing services to Greater Saint Louis residents. We specialize in solutions to meet all of your roofing needs, including roof repair and replacement in Chesterfield, Saint Louis, Saint Charles, Saint Peters, Florissant, O'Fallon, Belleville, Ballwin, Wentzville and surrounding areas.